McDonald Deluxe Rental Cabins are available for rent by the day, week, or month. Enjoy nature in the beautiful wilderness of northern Missouri for a family getaway or hunting trip. 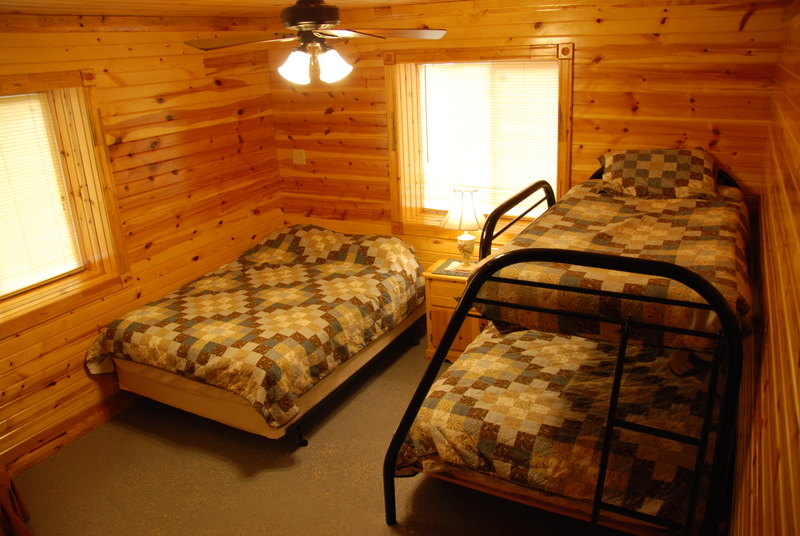 Cabins are 24′ x 24′ and fully equipped. Bedrooms have new pillow top mattresses, sheets, blankets and quilts. Bathrooms have furnished towels, coin-operated washer and dryer, shower, stool and vanity sink. Kitchenettes are fully furnished; each has a table, pots, pans, coffee maker, toaster, electric can opener. Kitchens also include microwave, refrigerator, and freezer. Living rooms include a full-sized couch, loveseat and daybed. 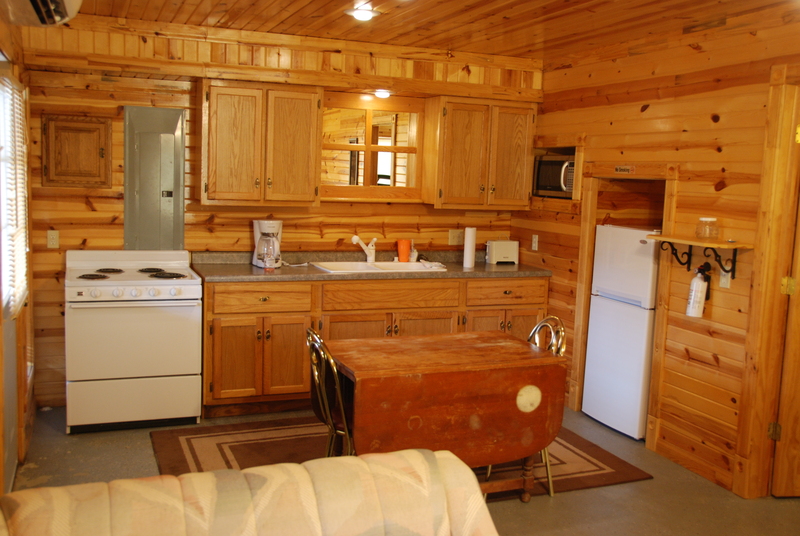 Cabins have central air conditioning and heat as well as satellite television and Wi-Fi Internet. Rules and regulations are posted in all Cabins. No pets are allowed. No smoking inside cabins but smoking allowed on decks. We DO supply toilet paper and trash bags. However, personal items like shampoo, soap, toothbrush, and tooth paste will NOT be supplied. All cabins are $75 per night for two adults with a charge of $10 per each additional adult guest. Children under 4 stay free – Children 5 to age 14 are $5 per night. For example – 4 adult guests = $95 per night. McDonald Deluxe Cabins are located three miles north of Lake Thunderhead, just outside of Unionville, Missouri. For directions, click here. McDonald Cabins are a family-owned and operated business. McDonald Cabins was established in the fall 2010. We are always striving to improve our customers’ experience. And we are always building something new on McDonald Cabins property. Whether it is new cabins, new parking, deer-skinning stations or picnic areas and play areas for the children. Come join us, and let us accommodate, whether it be a weekend getaway, hunting trip, family reunions, weddings or job related, or just to play at Iowa’s Biggest Ocean, Rathbun Lake. Local fairs, such as Putnam County’s Fair, Appanoose County Fair, Pancake Day, Old Settlers in Corydon, IA, or Moravia’s Fall Festival, or needing lodging in the Putnam county area or Southern Iowa, our door is always open. We will do our best to accommodate your stay. We accept checks, cash and all major credit cards. There is an additional $6.00 fee for credit card processing. A $35.00 fee will be added for all returned checks. Deposit is required during major holidays and for large party bookings. All deposits are non-refundable during September 1st through January 1st. The owners are not responsible for any accidents, injuries or illness that occurs while on the premises or its facilities. We also are not responsible for the loss of personal belongings or valuables of the guest. By accepting the reservation, it is agreed that all guests are expressly assuming the risk of any harm arising from their use of the premises or others whom they invite to use the premise.